The hardest part is getting the old stripes off. I first tried using decal remover on the passenger door. I used about half a can of aircraft decal remover getting most of the upper stripe set off. I then sanded it down until I got it smooth and no trace of the stripes showed through the primer. It was going to take me forever to sand the whole thing down so I switched to paint stripper. With the stripper I managed to remove all the stripes and the paint below the stripes in one day. I have half the body work done on it. The hood was beat up pretty badly and there was a rust place on either back wheel well that needed patching. The rest of the body didn’t have any rust or damage at all. The running boards are off and will be painted separately before putting them back on. 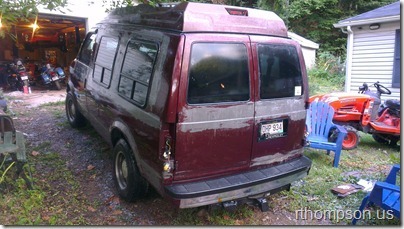 I have to smooth the edges of the paint that is still on the van before I can prime the whole thing and repaint it. I am just painting it back the same color and will either restripe it later or find a mural to go on it. 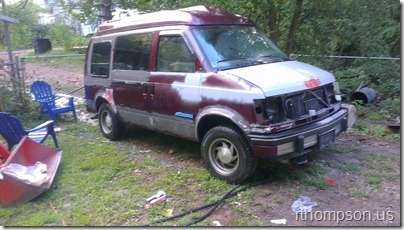 But for now just getting it painted and nice looking is all I am wanting.